When my wife and I moved to northwest Austin in search of cheaper rent and closer proximity to family, our downtown friends sighed and asked, “Where are you going to eat?” Upon first glance, the stretch of FM 620 between Steiner Ranch and Lakeline Mall offers little in terms of tasty grub not sourced from a freezer. Our culinary outlook seemed grim. Fortunately for us, Oasthouse Kitchen + Bar lies minutes from our garage and steps from my son’s daycare. An oasis of upscale yet accessible culinary delight, this neighborhood gastropub has become my family’s go-to for bar bites, date nights, and everything in between. The visit described in this article was provided compliments of Oasthouse Kitchen + Bar. All previous and subsequent visits were not. All opinions are my own. Born Iranian and raised Austinite, Oasthouse owner/chef Amir Hajimaleki has been combining the flavors of his blended cultures since high school. After receiving classical French training at Le Cordon Bleu, Hajimaleki jumped around several local spots until landing at Kona Grill. There, he learned the ins and outs of running a restaurant, knowledge which complemented his already stellar skills in the kitchen. After opening District Kitchen + Cocktails with his brother to resounding acclaim, Hajimaleki looked for his next venture. After careful consideration, he landed in the Four Points area of northwest Austin and built the sort of restaurant the area desperately needed. Largely comprised of reclaimed wood, tasteful furnishings, and the occasional tree from a friend’s backyard, Oasthouse’s decor is best characterized as rustic elegance meets down-home comfort. Rather than dominating the experience, the environment is like a great bass player, delivering a groove that allows food and conversation to take center stage. With a menu this robust, why should anything detract from it? After spending 10 minutes with Hajimaleki, it’s easy to see where the heart of Oasthouse’s culinary vision dwells. This chef believes food should be adventurous enough to challenge the palate, yet cozy enough to be enjoyed without trying too hard. 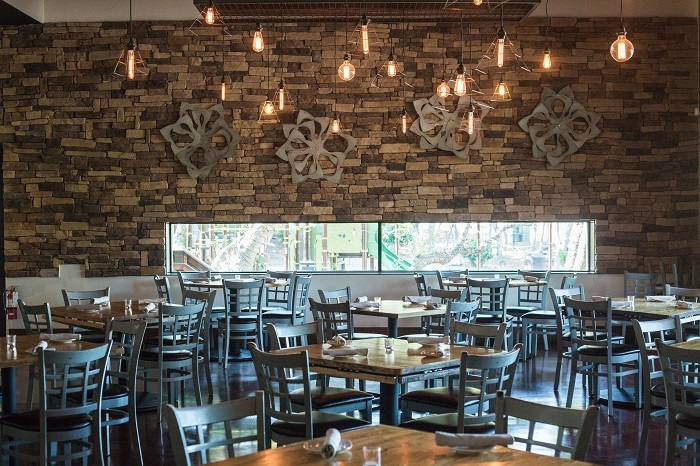 Combine that vision with a vigilant focus on keeping the menu seasonal and sustainable, and you have food worth venturing to FM 620 for. 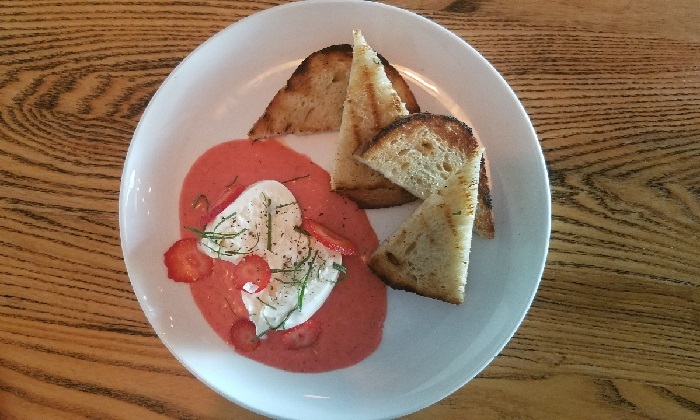 At my recent visit, my first course was the outstanding burrata + strawberry starter. Bursting with the aroma of fresh strawberries, the cheese’s creamy texture balanced out the fruit’s subtle acidity. Combined with a crisp toasted sourdough, this dish combined textures and flavors to an absolutely stunning result. Next was a spot-on veal schnitzel with housemade mushroom gravy and German bacon potato salad. 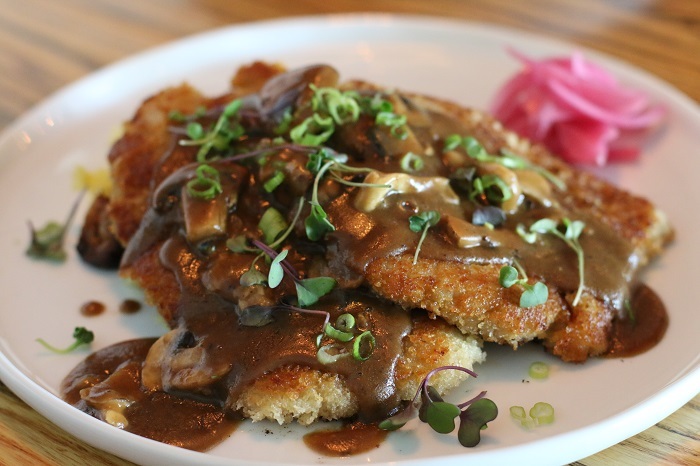 I’ve had schnitzel so tough you could stop an attacker with it, but Oasthouse’s take was tender with just enough chew to make it authentic. The gravy and chopped porcini and oyster mushroom blend provided a rich, warm texture to the veal while the accompanying potato salad delivered just enough vinegar acidity to brighten up a hearty dish. And then there’s the king of the tasting. 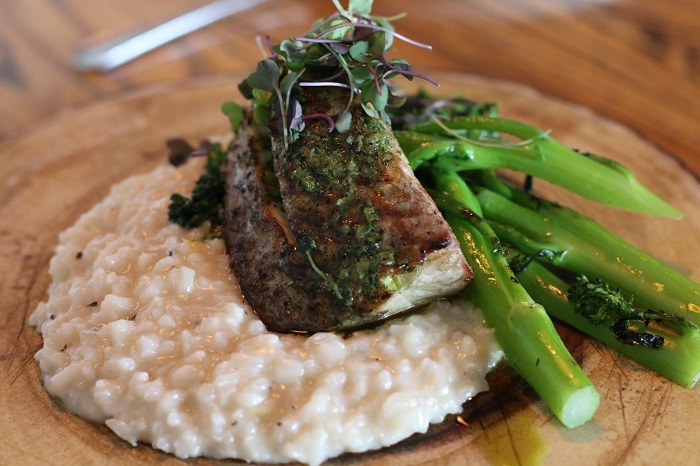 All hail the Texas gulf redfish entree. This beautifully grilled redfish, covered in jalapeño cilantro butter, provided the right amount of heat to an already flavor-packed fish. Add to the party a lemon thyme risotto worth holding up banks for, and a broccolini so well prepared that I forgot it was broccolini. Outstanding meal. Not to be outdone by the food stuffs, Oasthouse’s beverage program follows the same ideals: keep it local; keep it fresh; and keep it authentic. Head bartender Zach Sasser has curated an inspired cocktail menu that includes signatures like the incredible Wild Child (single barrel reposado, Buffalo Trace bourbon, blueberry simple syrup, lemon, orange bitters) and classics like a spot-on Sazarac. 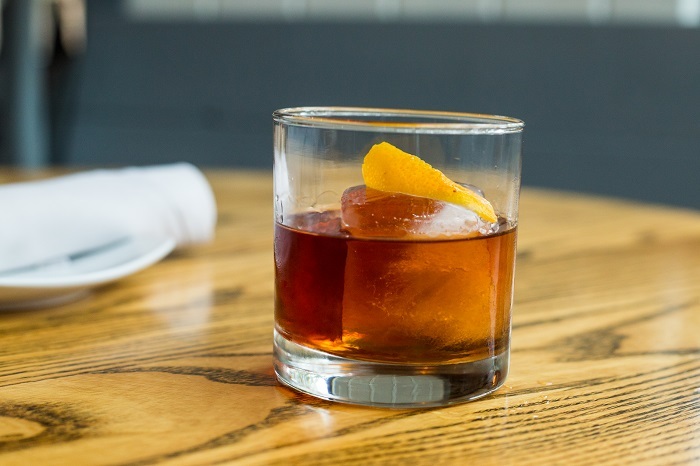 And dare I say Oasthouse is home to one of the finest old fashioneds in all of Austin? Easy to make, difficult to perfect, this cocktail is my entrance exam to bar acceptance. Spoiler alert: Oasthouse passes with flying colors. The craft beer program is also top notch. Since I’m a beer geek first, everything else second, I appreciate that Oasthouse always has something new and interesting on tap. And like everything else, the beer program evinces a heart for keeping it local. Hyper-small breweries like Altstadt, Rentsch, and Whitestone have found regular tappings on this wall, and other surprises appear monthly. The good-time vibes go on and on. When my wife and I moved north two years ago, we expected a life of Dominos Pizza and Chicken Express. Thanks to places like Oasthouse Bar + Kitchen, we’ve been able to enliven our palates, indulge our love of craft drinks, and reconnect over brews and bites in a laid-back, welcoming setting. A wonderful place to eat, drink, and enjoy some of the finest food 620 has to offer. Where do you get your foodie fix in the Four Points neighborhood?